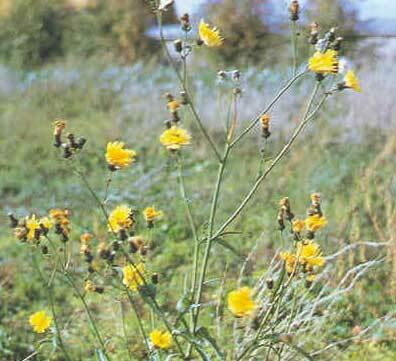 BACKGROUND: Perennial sowthistle is native to western Asia and Europe. It spreads both by seed and creeping roots, and it grows under a many conditions. 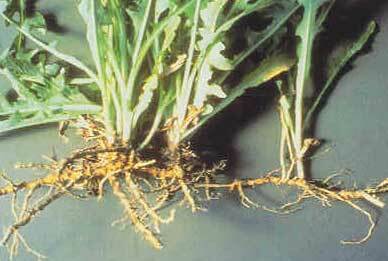 Plants produce from root buds as deep as 2 feet, often resulting in large, dense colonies. DESCRIPTION: Perennial sowthistle has crowded, spatula-shaped to deeply lobed, dandelion-like leaves up to 10 inches long near the base of the plant. Stem leaves are much reduced, usually unlobed, and scarce; all leaves are prickly toothed along the margins. Stems are hollow, sparsely branched, and up to 6 feet tall. Both leaves and stems exude a milky latex when broken. Yellow, dandelion-like flower heads are 2 inches wide and bloom from June until frost. The flower heads and their stems bear coarse, spreading, gland-tipped hairs. Seeds are reddish brown, 1/8 inch long, flattened, ribbed, and tipped with white plumes. The plant has extensive horizontal roots. DISTRIBUTION: Perennial sowthistle is present in the northern U.S., and in California, Texas, Missouri, and North Carolina. CONTROL: No biological control agents are available, but herbicides are.